The verdict is out: Rolando Villazon is back from the darkness: let's all give him more time to fully recover his powers, but the passion is still there. And the voice, everyone who was there at the Staatsoper agrees, is back. Thus spoke those who were present last night: the OC correspondent who last night sent us -- many thanks! -- a quick recap for our breaking news post has now written more for us, and we happily publish that below. Another friend and reader who was there has sent a small review. And the German-language press, the AP, and even a French-language blogger have joined the fray. So please enjoy this Sunday recap of our dear Rolando's comeback. 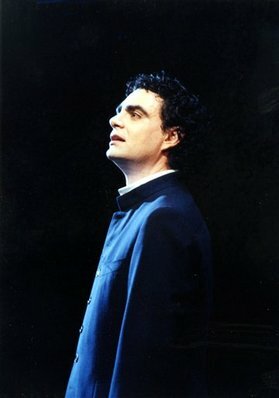 "It was difficult not to feel sympathy for Villazon when he came on stage because clearly something is still missing in his spirit, judging from his expression: the sad look in his eyes was maybe not exclusively connected to the acting in Werther, or so many of us thought. Never an imposing man, he also looked even more slender. The drab costumes didn't help either. The Viennese audience is not usually loud, the opposite is true, but you could sense everybody was rooting for Villazon. I don't think that a substandard performance would have been welcomed well just because people like him and he has had problems." "He sang well, with that recognizable timbre of his, without forcing anything, even considering that he also risked being upstaged by a very convincing Sophie Koch, but he seems to have won against his demons, and the six months of rest certainly did benefit his voice. I think he's at 60, 70 percent of the pre-illness Rolando, but there's no reason why he shouldn't improve in the next several weeks. He was cheered very loudly, with real warmth. Everybody seemed to be happy for him, as if the possibility of his career ending in ruins had been canceled by the performance. Time will tell, he has a few engagements in the next few weeks. He seems to be doing OK. He probably needs more confidence. I was happy for him, he seems to be on the right track." "Here's my two cents on Werther: Rolando was wicked good, with a deeply moving performance, though he was a wee bit cautious, which wouldn't have been a problem if it hadn't been for a very loud orchestra. Now, a conductor's supposed to know that the Vienna opera pit is dangerously high up for singers. I was standing far back in the galleries, so view of Armiliato was obscured, but one of my pals down in the parterre said that Armiliato was waving his arms like 'he was trying to bring down an airplane!' ...not. cool. not. nice. Especially not when it's a singer's first night after a long break. According to my friend (who is a singer) this kind of conducting would be outrageous & nasty with any singer. (As far as I know, Armiliato's worked with Villazón loadsa times, so I'd never think they'd hate each other or anything...) Other than that it was a great night. Sophie Koch (who also was kinda loud but not so that it bothered) has these really 'RAH!' cool low notes that just made Charlotte so heartbreaking." "The Mexican tenor's nerves were quite evident, the audience gave him a warm welcome, a small ovation for his entrée en scène. His performance was generous and intense. One is impressed by his peculiar habits, his crescendos, his weird accents. I don't think he has recovered 100% his means -- and his nerves were palpable -- but his magnetism is undeniable." "VIENNA -- By the end of the show, the audience was relieved. The sold-out Vienna State Opera was overjoyed for the Saturday evening comeback of Rolando Villazon: and the star tenor was visibly pleased, as if it were his first successful premiere." "His partner, the radiant Sophie Koch happily hugged the Mexican singer after his long absence from a major opera house's stage. The audience of the Vienna State Opera knew the importance of the evening: would the 35 yo tenor, who had cancelled three dates in Vienna in 2007 due to vocal problems, experience a difficult comeback? As soon as he stepped onto that stage, the audience gave a long, warm applause of encouragement." "Although he appeared to be hitting his high B's, it wasn't always apparent — because when trying too hard to be heard, Villazon's lyric tenor just seemed to top out among all those potent brass passages of the second and third acts." "Villazon himself appeared to be less than completely satisfied. Miguel Perez, who described himself as a friend of Villazon from Barcelona, said the tenor told him between breaks that he was 'very happy' with the first act but 'not very happy with the second.'" "'It's a very emotional evening for him,' Perez told the AP." "If so, Villazon put those emotions to wonderful use. On Saturday, his theatrics made him the quintessential Werther, the emotionally vulnerable, brooding young man who obsesses over a woman he cannot have, shoots himself — and dies happily in her arms after she confesses her love for him." OC Review (from Milan) in two words: Bentornato Rolando! (And why does OC like Rolando so much? Oh, long list: the red lamé jackets, the mechanical bulls, the pretending he's got to pee twenty seconds before he has to go out on stage just to terrorize everybody backstage; the unabashed passion for the music; the deeply, deeply moving sound of his voice; and because he makes us laugh and he also makes us remember that, yes, you can die for love).